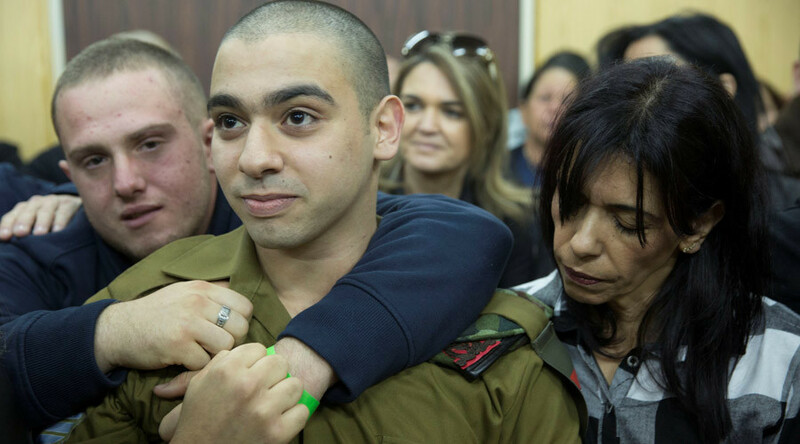 An Israeli soldier who shot and killed an immobilized Palestinian assailant was convicted of manslaughter, but chances are he won’t end up in jail, as many Israeli politicians support the soldier, experts say. A guilty verdict was handed down on Wednesday to an Israeli soldier who shot and killed an injured Palestinian attacker. Elor Azaria, 20, a soldier of the Israeli Defense Forces (IDF,) shot the injured man, Abdul Fatah al-Sharif, 21, in the West Bank city of Hebron in March 2016. The court stated that the Palestinian man posed no threat and there was no justification for the killing. Clashes broke out between police and supporters of the soldier while the hearing was taking place. The convicted soldier has a lot of support among Israelis; many say he is a hero. Israeli Prime Minister Benjamin Netanyahu urged President Reuven Rivlin to pardon the soldier. RT asked lawyer Rami Saleh, a director at the Legal Aid and Human Rights Center, what message this sends out to other Israeli soldiers. “The Prime Minister himself is encouraging the Israeli soldiers to conduct the same action,” Saleh said. Sgt. Azaria is now facing 20 years in jail for manslaughter. Sentencing is expected to be announced in the next several weeks. Meanwhile, the defense team said they would appeal the verdict. According to Saleh, there have been “many cases” when “really harmless” Palestinian “children” were killed at checkpoints. He recalled an incident with Israeli forces allegedly killing a young Palestinian woman and her teenage brother at a military checkpoint between the cities of Ramallah and Jerusalem. — RT (@RT_com) 5 января 2017 г. “One of the cases that our organization has followed – was Maram and her brother [Ibrahim.] He was a youngster – less than 18 years, and they were both shot [at] the Qalandiya checkpoint, because the soldiers considered them threatening to the soldiers,” the lawyer said. In his view, the “Israeli legal system is not conducting justice” and “many Israeli soldiers” involved in similar cases in the past were only sentenced to “less than a year” of public service. Sahar Francis, director of Addameer human rights organization, also thinks that it’s unlikely that Sgt. Azaria could end up spending many years behind bars. “Even if the court sentences him, the maximum sentence in this case could be 20 years. Even if gets the maximum sentence, I don’t believe that he would spend all the sentence [in jail],” she said. RT spoke to people outside the court on Wednesday. One woman said that there were incidents in which wounded Palestinians went on to attack people, despite their injuries. According to Sahar, this does not serve as justification for the Israeli soldier’s actions. “The court decided that there was no justification: the guy, the Palestinian, Abdel-Fattah al-Sharif, was paralyzed and was shot. Actually opening the... standards – first they have to shoot in the air to warn, and then in the legs. In all of the cases that we documented in the last year it was shooting in the upper side of the body. It means there is an intention to kill,” she said.